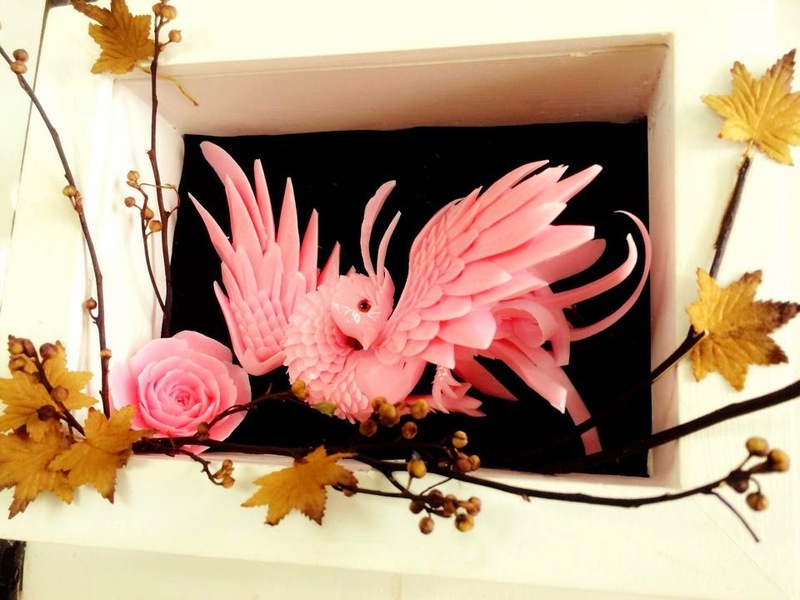 In my continued efforts to portray the work of some of the wonderful Vegetable and Fruit Carving Artists who I have come across during my writing and Blogging about this great Art, this is one such post about this young and upcoming artist. It is indeed a privilege to promote the work of such young artists amongst others. Komkrit is at present a Carving and Thai Food Teacher at Voice Hobby Club - Bangkok Thailand. 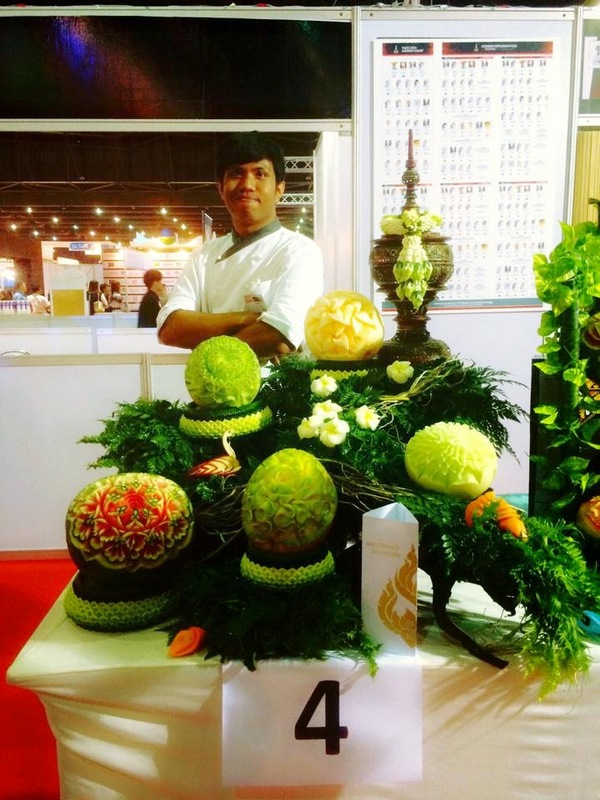 He has achieved a lot of distinctions such as - 1 Silver , 2 Bronze medal in TICC Food and Hotel Bangkok 2012, 3 bronze medal in Thailand Ultimate Chef Challenge 2013 THAIFEX–World Food Asia,1 Silver,1Bronze medal in TICC Food and Hotel Bangkok 2013, 4 Bronze Medals in TICC Pattaya Food and Hotel 2014. Apart from these medals he has been awarded with the following Certificates certainly a great achievement for such a young artist. As all of my wonderful friends on Facebook did, I got acquainted with Komkrit, during interactions on my Page as well as posts on Facebook, and thought of portraying some of his best works on my Blog for all of you to see. Besides the work you can see on his profile page and Facebook page above these are some of his great works which he himself selected to be loved by him. I am sure you will like them as you can clearly see the finishing, finesse and dedication that goes into his work. Some of his work of carvings are exhibited below. 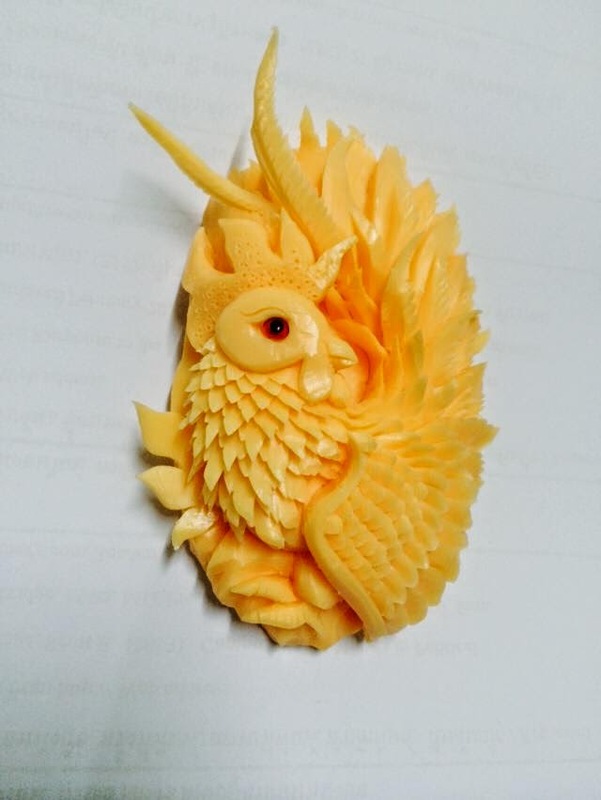 Besides his Fruit Carving and Vegetable Carving he has also done some really great Soap Carvings which I am posting here. Some of his wonderful Soap Carvings! I am sure there are many more of his exquisite work masterpieces but I have put only a few here. His Facebook Page at https://www.facebook.com/Animocaving is proof enough of his wonderful work. I wish him All The Best in his work and career, and am sure we will be seeing a lot of his work coming up. As mentioned in my last post, I will be highlighting the various Fruits found in Thailand, and also trying to give images both of the Fruits and Carvings of that fruit if available. 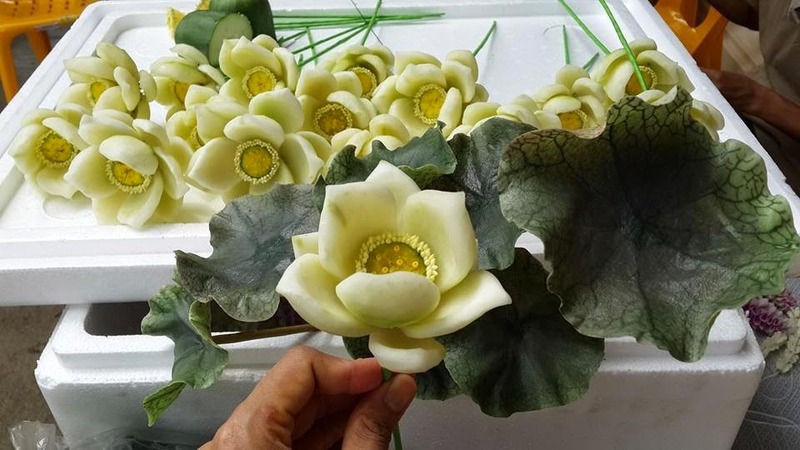 As you will see there is an abundance of Fruits in Thailand and most of the Wonderful Carvings and Presentations of Fruit carvings flourish from these fruits. As promised I will also give a brief description and idea about the destination these fruits are found, which at present again is Thailand so the viewers all over the world who read my Blog can also benefit from the information and even try and visit Thailand in their Holidays. I have also tried to highlight and recommend one of the few of Travel Tours Acencies who are known to me or are my friends so you can take benefit of their wonderful quality services, and tour packages. I am sure you will like this new concept of Vegetables, Fruits and Destinations which I will be writing a series of posts. The information about the destinations will be inserted in between information of fruits as an interlude and also to make reading more enjoyable! Starting with Fruits in Thailand - Like the charming people of Thailand, exotic fruit greets you on almost every corner in Thailand. The country's fertile plains and hot tropical climate, as well as its more temperate northern regions, means that pretty much anything grows here. As a result, few places on earth can claim to have such a plentiful supply of gorgeous tasting fruit. 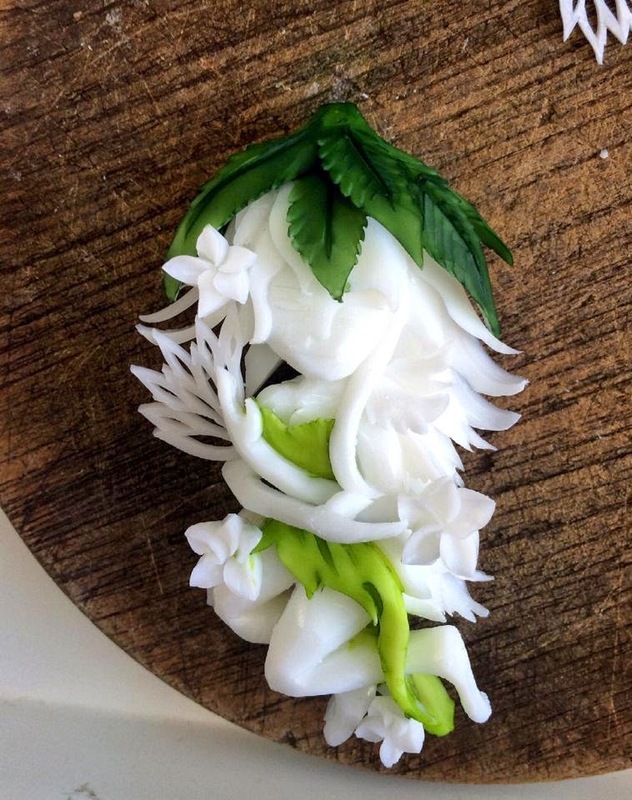 This is clearly visible in the way Thai treat their Art of Vegetable and Fruit Carving so seriously and every hotel, event, or even home will be displaying this art like a religion. Take advantage of this abundance by trying to know as many as possible, but also trying to use them in your carvings. In my subsequent posts I will try to dedicate a post for each of these Fruits and portray carvings and tabletop presentations about those fruits for your benefit. Not only is fruit cheap and abundant in Thailand, but as it is healthy and nutritious, it's also a great way to rehydrate - a superb snack. I have written a brief description about each fruit and added an image of that fruit and a carving if possible for your idea. Bananas (Gluay) – If you think you have eaten enough Bananas, which are grown and found almost all over the world, and then you are mistaken! There are over 20 different types that grow in Thailand - ranging from small stubby ones to large fleshy types - each of which have different names. In Thailand you'll find them eaten any which way: pure, dried, boiled, fried, served in sweet coconut milk or, simply, enjoyed fresh. 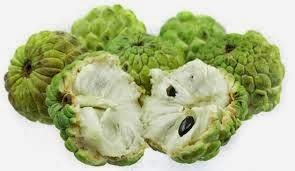 Custard Apple (Noi-Na) –This fruit is also abundantly grown and eaten in India. The flesh of this knobby textured fruit is, much like custard, best eaten with a spoon. The sweet tasting meat contains tiny black seeds. It is also used in Milkshakes and Fruit Salads. 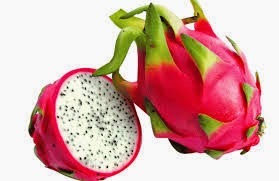 Dragonfruit (Gao Mung Gorn) – This exotic fruit is now catching the fancy in various countries. It is fruit of a cactus plant, the strange, unearthly looking dragon fruit with bright color has a lovely soft flesh that looks somewhat like that of a kiwi fruit and is typically eaten with a spoon. Some exquisite carvings are seen carved from this Fruit as it has a wonderful color combination. 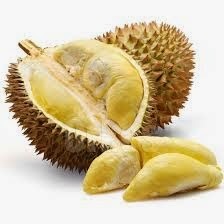 Durian (Tu-Rian) - Surely the most controversial fruit on earth, durian is to its fans a rich, unique tasting fruit, and to its critics, a putrid-smelling, lame duck of a fruit. Its extremely strong aroma which let alone its aggressive look, is enough to put many off tasting it altogether. Some Thai residents swear by it. Its the most expensive of all Thai fruits and actually banned, yes banned, from some public places, hotels and on planes. 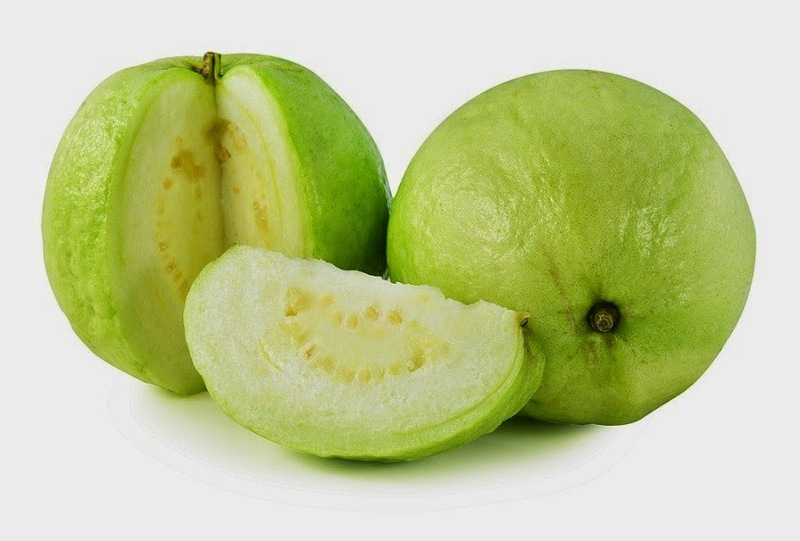 Guava (Farang)- Originally from Central America and the West Indies, Guava is now grown in many tropical countries and favored especially for its fragrant, exotic taste. Available all year round, it makes a popular snack that can be eaten green and crunchy alongside salt, sugar and chilly, or when ripe. 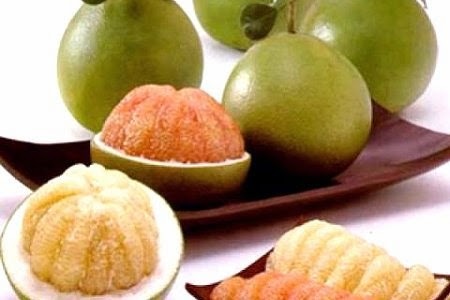 Tasty and highly refreshing, guava can also be made into delicious drinks, luscious ice creams or rich jams and jellies. It's Thai name, Farang, is also the term that foreigners are known by same as in native “Hindi” in India we say “Firangi” – or outsider. Jackfruit (Khanoon)- Available between January and May, the jackfruit is roughly the size of a large melon and packs a distinctive aroma and succulent taste. Divided into multiple sections, each of which contains a waxy textured meat surrounded by seeds, it is usually eaten raw, although some Thais like to fry it in batter. Even in India you can find Jackfruit in huge sizes especially in the state of Karnataka. 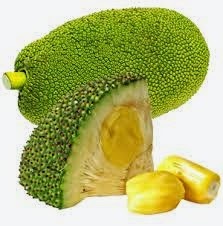 In India residents make innumerable tasty dishes and snacks out of the flesh of the Jackfruit and even the seeds are boiled and eaten. Some of the Fruit Carvings from these fruits. If you are looking for the ultimate experience in that includes wonderful and adventurous city life, a walk through the wilderness and finishing it up with romantic and exotic nightlife on beaches, look no further than holidays to Thailand. One shall start the journey at Bangkok; which is the gateway to Thailand and the capital city. Bangkok’s well known places include the Grand Palace as well as the major Buddhist temples of Wat Pho and Wat Arun. There are a lot of boat trips and cruises that offer immaculate views of this wonderful city. Krabi is a small town in Thailand, with a majority of its area given to several national parks. Krabi honeymoons packages offer the same excitement as the other popular destinations at much affordable prices. It consists of several small islands which provide adventurous activities like scuba-diving and snorkelling. Pattaya is known for its sandy beaches with light blue waters. Another major attraction in Pattaya is underwater world, which is one of the biggest and ultramodern aquariums in Asia. It proudly puts on display the 200 different sea water species. At the entrance, there is a touch pool, where tourists, especially kids can touch and interact with the harmless species like starfish. Thailand tourism is the best available option for people in South East Asia. Explore Exotic Thailand with this Thailand Explorer. Back to our Fruits again! 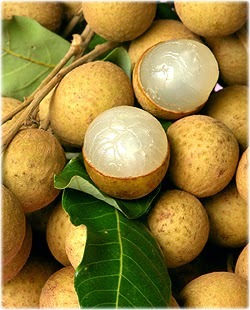 Langsat (Lang-sard) - Native to Thailand, the langsat is a small round seasonal fruit available between July and October. You will have to prise open the thin, off white skin and you'll find a translucent, juicy flesh with a slightly tart flavour. 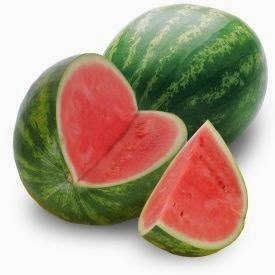 An excellent thirst quencher, its flesh falls away into five segments and is best eaten raw. Longan (Lam-Yai) - A lesser known sibling of the lychee and rambutan, the longan has a sweet, delicate flavour and grows in Northern Thailand in the Chang Mai area, especially between June and August. The skin is pierced by the finger and the delicious, juicy flesh revealed by squeezing it out of its shell using the thumb and forefinger. 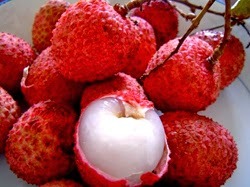 Lychee (Linjee) - Covered by a red, roughly-textured rind that is inedible but easily removed, the inside of a lychee consists of a layer of sweet, translucent white flesh and has a texture somewhat similar to that of a grape. 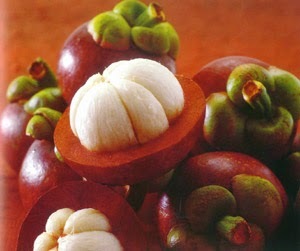 The centre contains a single glossy brown nut-like seed that should not be eaten. This gorgeous fruit matures from July to October, about 100 days after flowering. The Lychee is enjoyed all over the world and you will find it eaten as a fruit, in Jelly sweets, in squashes or drinks and even a Martini! Mangosteen (Mang-Kut) - Little known outside Thailand, the Mangosteen is a bizarre looking fruit that contains in its round, deep purple shell a delicate, flavorful white flesh that is eaten in sections. I is noticed that the number of sections found inside match the number of petals found on the bottom of the shell. A delicious, distinctive flavour also makes it wonderful for juices. Mango (Ma-Muang) - One of the most well-known fruits in Thailand, and also In India there are many varieties of the delicious, refreshing mango and a few different ways of eating it. When ripe, it can be halved and eaten with a spoon, while many choose to enjoy it with sticky rice and coconut milk (Khao Niew Ma-muang). 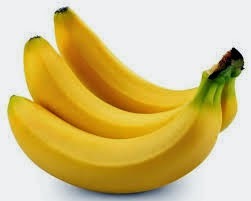 Others like to eat it half-ripe and dip the crunchy slices in sugar. Also makes a wonderful juice. Its fleshy inners make it an ideal fruit for carving especially as it has a rich vibrant yellow color. 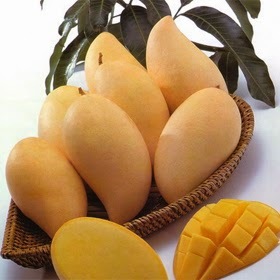 In India raw mango is abundantly used in Pickles, Jams, sweet cakes, and juices. 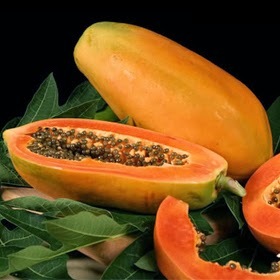 Papaya (Ma-La-Kaw) - A delicious year-round fruit that is at its best between March and June, the papaya is oval in shape and cut lengthways to remove the small black seeds in the middle. When ripe the soft dark orange coloured meat is full of flavour. Thais like to shred unripe papaya and mix it with lemon juice, chillies, peanuts and dried shrimp (Som Tam) - one of Thailand's favourite salads. 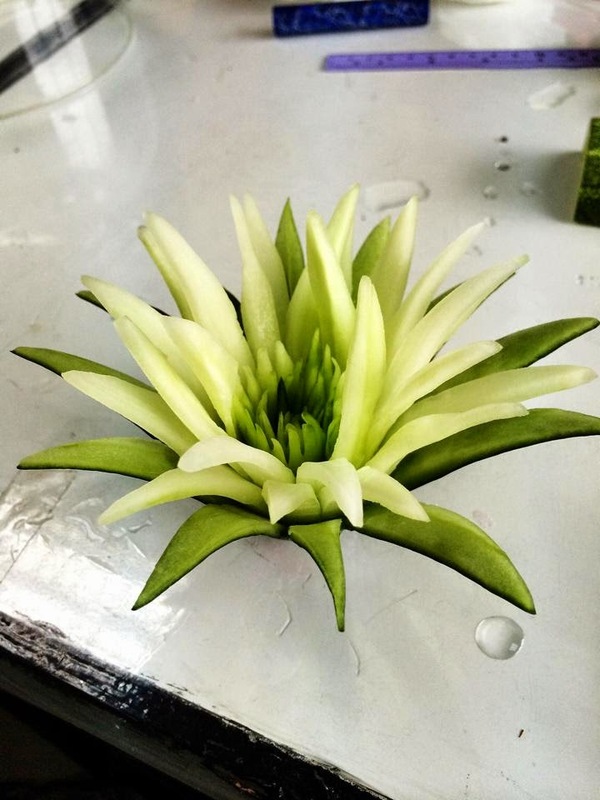 Its unique green and orange color combination makes it an ideal fruit for carvings and as centre piece and you will find maximum Fruit Carvings made out of the Papaya just like the Watermelon. Thailand is known as the party capital of South East Asia and holidays to Thailand are known for the fun and excitement. Bangkok, the capital is well known for its towering skylines and colourful nightlife. Bangkok tourism makes one relish the diverse population where many nationalities come together. Despite the metropolitan status, the city is extremely safe for visitors and adventure seekers. Dining and lodging are available in all the price brackets; one can choose to live in the stupendously luxurious hotels or the cheaper youth hostels are the best for travelling students. The city offers plenty of things for every family member such as shopping, adventure activities and sightseeing. Phuket Tourism offers one of the most serene and sublime experiences. The range of activities which Phuket gives despite its size is absolutely mind blowing. “Phang Nga bay” is the most unique tourist destination in Phuket, a day’s sail in the bay with its sheer limestone cliffs and emerald green water is an unforgettable experience. It is a well known honeymoon destination and newlyweds can try out the various Phuket honeymoon packages! Thailand has a warm, tropical climate affected by a seasonal monsoon. Thailand experiences a rainy season from June to October and a dry season for the rest of the year. Temperatures average 75 to 92 degrees Fahrenheit, with the highest temperatures occurring from March to May and the lowest appearing in December and January. 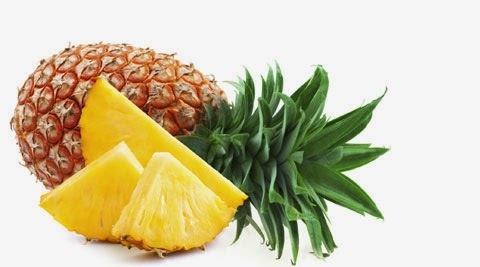 Pineapple (Sapparod)- The Kingdom is one of the largest producers of this flavourful, juicy fruit. Growing year round it is best planted in sandy seacoast soil, and grows on a low lying plant. It's an incredibly versatile fruit that finds its way into desserts, drinks and savoury dishes. 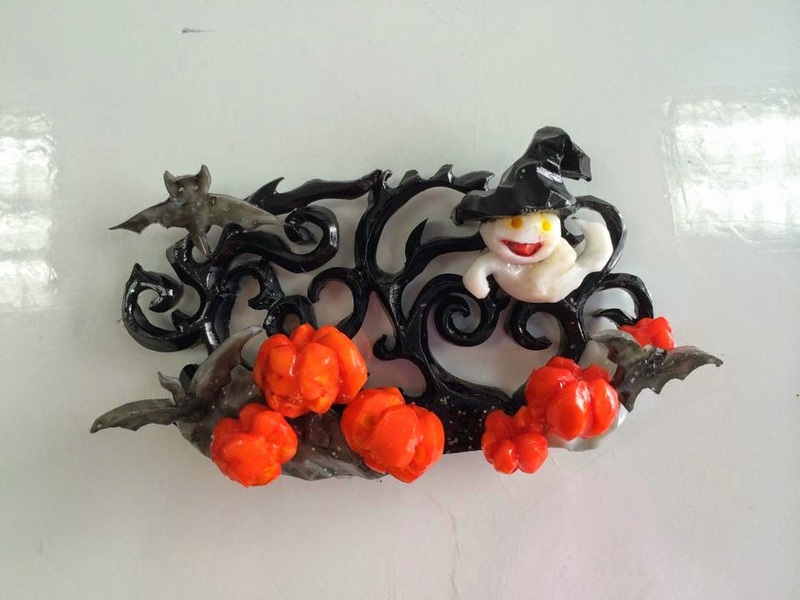 This is one of the other fruits that is frequently used by Artists for Fruit Carving. Pomelo (Som-O) - Similar in size and taste to grapefruit, the meat of the Pomelo is succulent and has a delicious sour-sweet flavour. Available all year round there are many varieties varying from pale yellow to orange or red. You can see a lot of good carvings or displays made with this fruit. 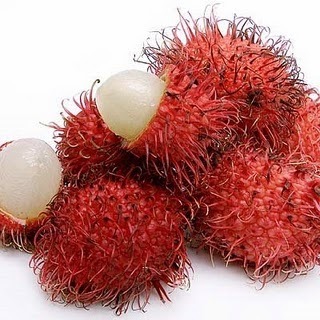 Rambutan (NgoR) - Its name is derived from the malay word for rambut, meaning hair - a result of the fruits red and yellow spiky rind. Peeling this away reveals a firm, white, translucent flesh, something the Thais are especially adept at delicately carving away from its large seed. Attractive as it is by itself, it could be displayed well in Fruit Displays. 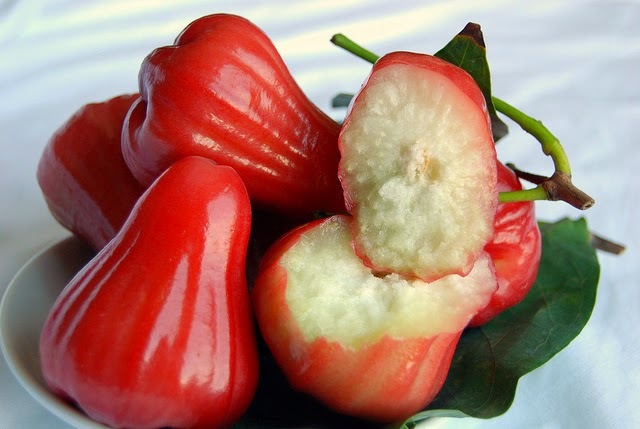 Rose Apple (Chom-Poo) - With a shape much like a pear, the rose apple has a shiny skin that is either pink or green in colour. Extremely refreshing and with a crisp, crunchy taste it is often eaten in Thailand with salt and sugar. 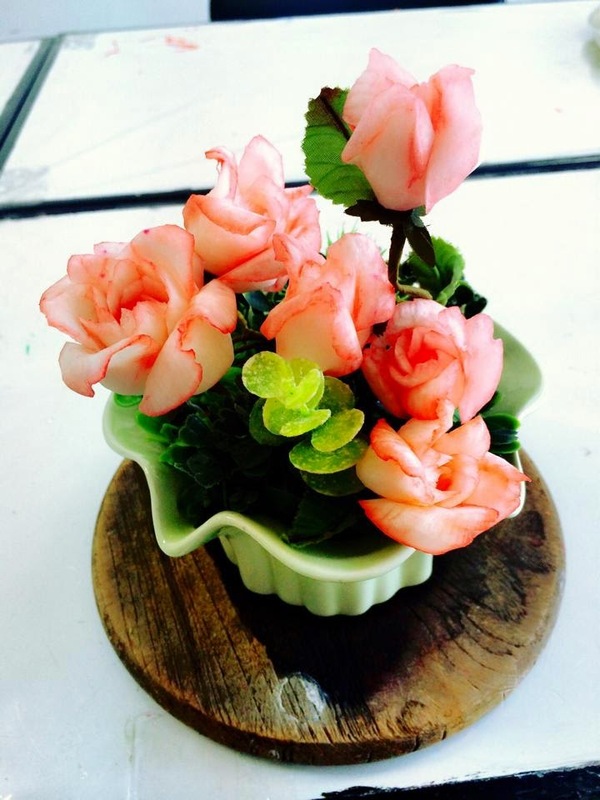 This fruit like the Strawberry could be carved well as it has a wonderful color combination, to make a Rose or even simple displays! Sapodilla (La-Mut) Rather deceptively, the dull and unattractive skin of this fig-like fruit masks the soft, succulent honey flavoured flesh to be found within. 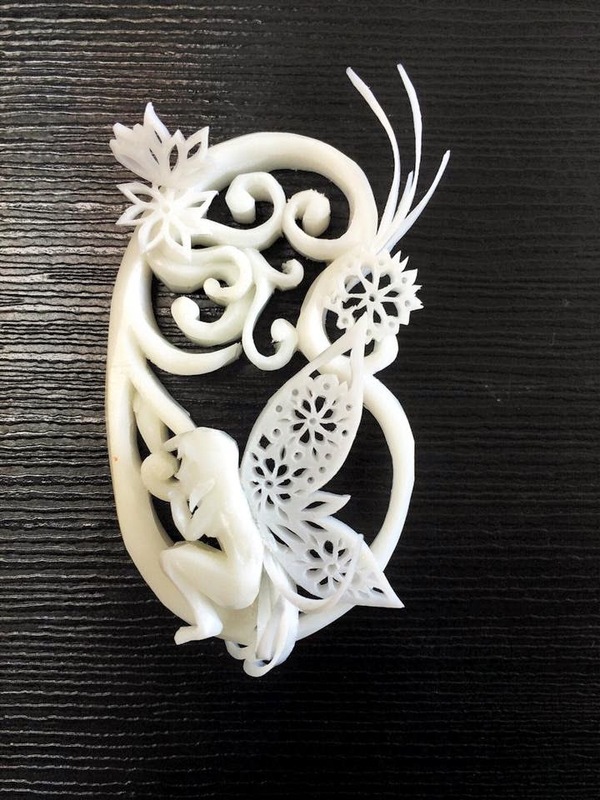 A knife is used to carve away the skin, and in Thailand you'll often find it carved into decorative shapes as will be seen in the image. 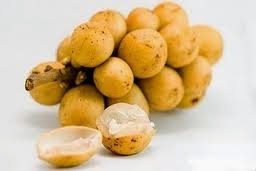 It is similar to the Chikoo in India. 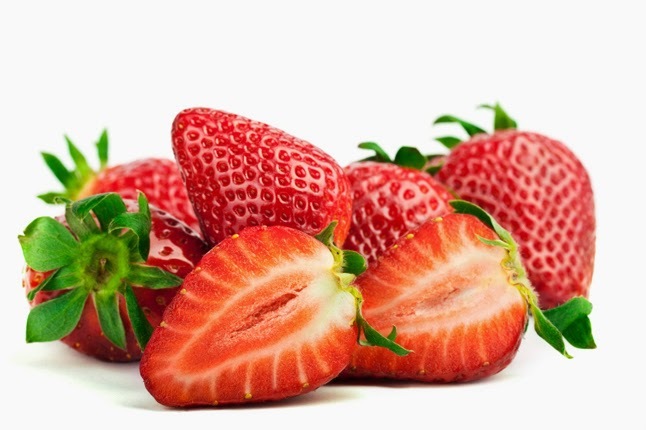 Strawberry - An immigrant to Thailand, the strawberry nonetheless grows well in Thailand's northern rolling hills. In the cool months between December and March, you'll find this luscious red fruit making an appearance at markets. They grow here to a medium size and are juicy and very rich in flavour. A Favorite to all Fruit lovers, you will find a variety of ways this Fruit is eaten – as it is, in Jams, Squashes, Fruit Salads, Milkshakes, Jelly, Custards, Ice cream, and not the least to mention fruit carvings and displays as well. Watermelon (Tangmo) Thailand's rich soil imparts watermelons here with a delicious flavour. Found in a rich ruby-red and more unusually a golden yellow colour, they are often used as the centre piece for fruit carving due to the intricate designs that can easily be made using the fruit's thick, green rind. You'll find that its thrown liberally into blenders to make delicious, refreshing drinks. A fruit that is high in cool water content is a favorite even in other countries especially during the summers. As you will see these are only some of the wide variety of fruit found in Thailand and what better way that to visit Thailand itself to get the true flavor of these fruits, as native fruits always taste uniquely tasty than those grown in alien countries, not the least to enjoy the wonderful Art of Fruit and Vegetable Carving itself. Explore Thailand and soak in the hospitality, love and the charming people of Thailand. Enjoy exotic fruit that will greet you on almost every corner in Thailand. 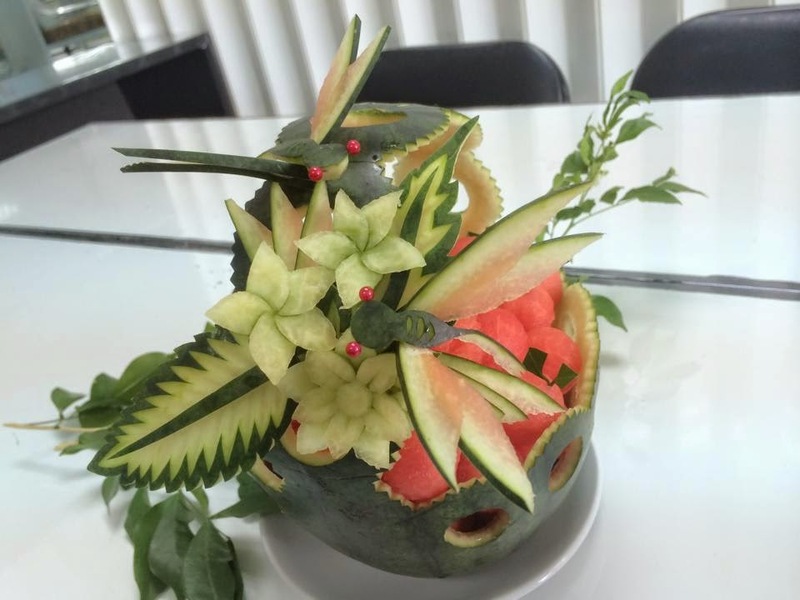 No better place to enjoy and learn the true Art of Vegetable and Fruit Carving than in Thailand. Keep a watch for my next post with other Destinations! Continuing on my effort to bring to my viewers the best information about Vegetable and Fruit Carvings, Tools, Accessories, Videos, Books, CD's, etc, I thought of giving them something more! In one of my earlier Posts I had mentioned that I would be writing about the various Fruits and Vegetables used for carving along with images and videos of those carvings. I have further worked on this and will be now posting various articles and posts not only introducing the Fruits and Vegetables used for carving, but also giving details of the places they come from,where they are grown, and also some information about those places and Tourist locations, with Travel information as well. This will not only make the post and article more interesting for all my wonderful readers but also enlighten the readers about the locations,the climate, and destinations to visit. Vegetables and Fruits grow in many countries, but are mostly native to specific countries whose topographical and climatic conditions allow the fruit to grow in abundance and also enhances the quality, texture, and taste of the fruit or vegetable. 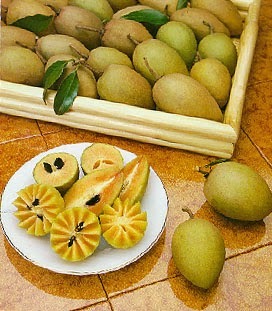 Many exotic fruits and vegetables are unique to a particular country or climate and are alien to people from other countries. Few people have even heard or seen the Fruit or Vegetable in their whole life, let alone taste it. This prompted me to bring forward this special Vegetable, Fruit and Destination series of Post starting with one shortly. My first Post to come would be none other than Fruits found in Thailand the very mother of the Art of Vegetable and Fruit Carvings. This will be followed by a series of similar posts which will not only give a brief description of the variety of Fruits or Vegetables found in those countries or destinations, along with some work of carving of some of those fruits and videos if available. This will be complimented with a small write-up on the Destination itself, its climate, geographic location, and Travel Destinations with some links to the best Travel Facilities available in those locations. 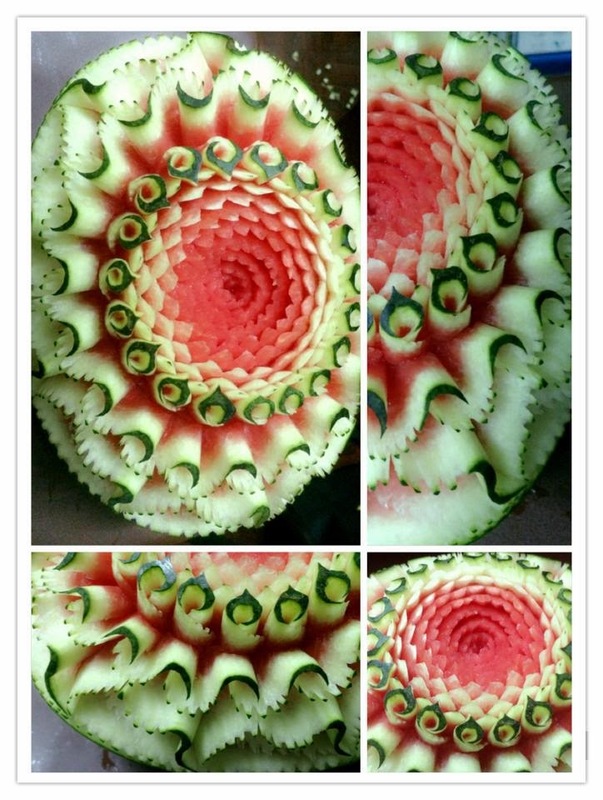 I am sure all you readers will like this whole new way of bringing forward to you this wonderful art of Vegetable and Fruit Carving! As always your views, comments, and suggestion via the comment box will be invaluable and highly appreciated.